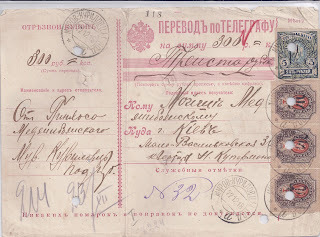 Stamps overprinted with the distinctive Trident handstamps of Podillia were introduced in the Podolia postal district - that is, in post offices using cancellations ending in "POD" - at the end of August 1918. Some were also distributed to Bessarabian post offices (notably Khotin). They continued in use into 1920 and even later. At the same time, stamps with the overprints of other postal districts were distributed in Podillia for normal use. Of course, philatelists also brought Tridents of other districts to the counters of Podillian post offices for cancelling. But with that I am not concerned. My guess is that this list starting with 33 Out-of-District uses can be extended to about 100. I base myself on the fact that I once had an extensive but not complete Podillia postmark collection with examples from about 150 offices in the 1917 - 1923 period. It's quite clear that Odesa Tridents (almost entirely rouble values) were widely used in Podillia.